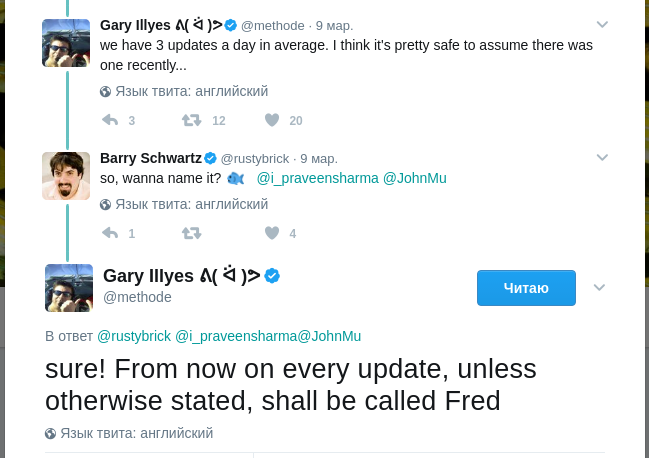 A month ago Google made new update called “Fred”. Fred caused SEO’s community hysteria. A lot of webs have lost their ratings and significant traffic. It's still unclear what the update is and what it's designed to fight with. With references? With advertising? Or maybe with a private blogs’ network (PBN)? One thing is clear, Fred has worked well. Actually, Google hasn’t formally provided a more or less informative answer how the algorithm works. By the way, maybe you have a question “why Fred”. It’s very simple. I’ll dub you a screen. On the next day after the update release, Search Engine Land published the article and suggested Fred's related to the fight against cloaking (with referral spam). Then Barry Schwartz put forward the idea Fred's targeted to huge advertising content with low cost and affiliate sites. Many people felt Fred’s influence. As I noted, Google’s never shared any information about its algorithms. But they don’t deny the fact confirming that something very significant has happened in recent days. Many SEO services are seeing huge fluctuations in Google's rankings. 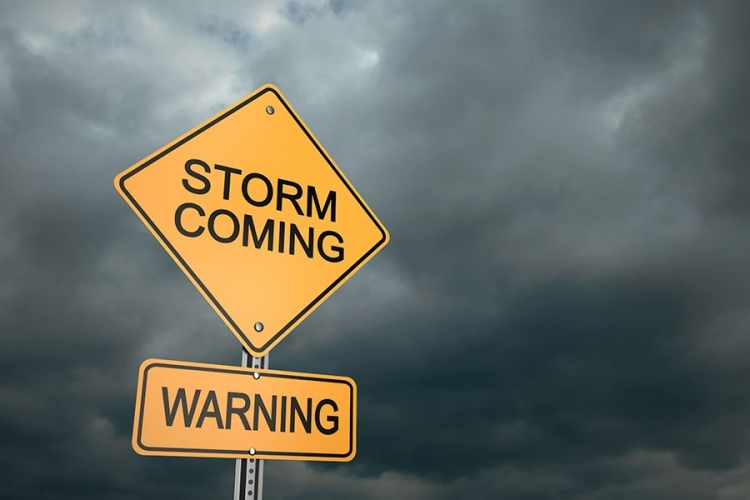 The storm warning is in the SEO community. Therefore, it seems to me this update is associated with a wide range of issues not just "referral spam” and " heavy advertising content”. It’s likely that Fred’s a new generation algorithm targeted at identifying and scanning a huge number of factors according to web page quality score. In other words, Fred’s designed to fight with sites created for the owners and Google bots, but not for users. Barry Schwartz, according to the data at his disposal, has determined that Fred’s affecting the site traffic with low-quality indicators. But this doesn’t explain yet the algorithm has blocked a lot of web resources. Others linked this update to the reference mass and using paid link exchanges. Some of the SEOs assume that Fred is targeted at sites bombarding their visitors with substandard advertising. In a nutshell, all factors were mentioned, that is connected with Panda, Penguin, and Pirate. By the way, Fred doesn’t seem to be like some of them. On the one hand, if we take look at one site it seems to be clear what the problem is. On the other hand, analyzing a large number of sites, everything becomes very confusing. Perhaps we should take a look Fred through the wide-angle lens. After all, one way or another, penalized sites have one common feature - they designed for Google Bots. Therefore, it seems Fred is targeted at such types of sites that are rated according to the recommendations of Google Quality Rater as low. One of the first steps to optimize the site is removing of advertisements. Although if your basic income depends on the ad quantity on the site, pay attention to the ads placement. It is possible that they overlap the main content and brake a reading logic. According to the principles of Google Quality Rater, this situation is under the low site index. About affiliate advertising, I can say the same. Google states that there are many high-quality sites with affiliate advertising. But, probably, sites with low quality are much more. So, if you have partner content and you are under Penalty Fred - browse your resource through Google tools. Check how your page is visible to a user. Possibly your content is still blocked by advertising. If you are penalized by Fred, re-review all your links leading to the site. What are these references, for what they were used? Were they under the interests of Google and SEO? Or are they useful to ordinary users? It doesn’t clear how Fred relates to SEO. There are quality standards that Google uses to place a low or high-quality content. After all, there are a lot of examples, that sites designed according to Google SEO template have low rang score and vice versa. Probably, Fred estimates the quality of the site according to many factors. So, it should not be included only "linked with links" and "related to advertising." There are a huge variety of judgments. Everyone has been confused and lost the solution of the problem. If you look closely at Fred, it becomes clear that this is a next-generation algorithm, targeted at sites that aren’t useful for users. What to do if the resource is penalized by Fred we’ve determined. If you are still lucky it’s great news. But it's not the time to relax, Google can launch its spiders and algorithmic ranking machine at any time.